Knarr Bundle ready for launch. The Knarr field is located in the northern part of the North Sea in 410 meters of water approximately 120 km west of Florø. The oil will be exported by shuttle tankers while the gas will be transported through a 100 km long 12-inch pipeline to British sector where it connects to the FLAGS system and ends up in St. Fergus in Scotland. 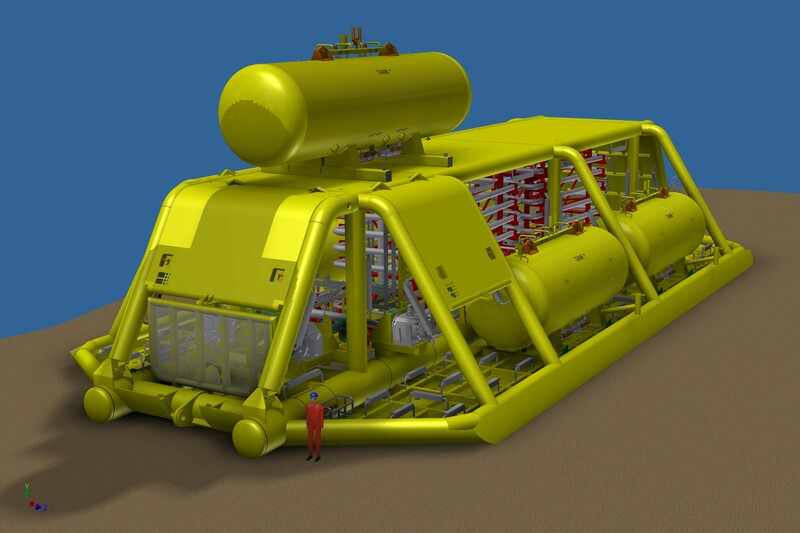 Subsea 7 has delivered and installed the SURF scope (Subsea Risers and Flowlines) including one pipeline bundle, flexible risers, umbilicals, subsea structures for gas export and also installed the two templates for production and water injection supplied by FMC. Installation, tie-in and testing have been ongoing more or less continuously for two years from April 2013 until April 2015. 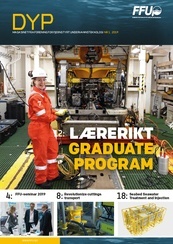 The pipeline bundle installed on Knarr was number 72 delivered by Subsea 7, and it includes two 8 inch/10 inch pipe-in-pipe production pipelines, one plastic lined 10 inch water injection pipeline and one 4 inch service pipeline in addition to the control cables for the two subsea templates. This pipeline bundle has set a new record in 410 meters water depth as the previous record was set on Heidrun in 350 meters. The towheads for the Knarr bundle are the largest ever made and measure almost 30 meters in length. This required barge transport from the fabricator to Wester site North in Scotland which is Subsea 7’s fabrication site for bundles. Pipeline bundles are fabricated onshore in lengths up to 7.6 km and all piping and control system components are tested prior to installation. 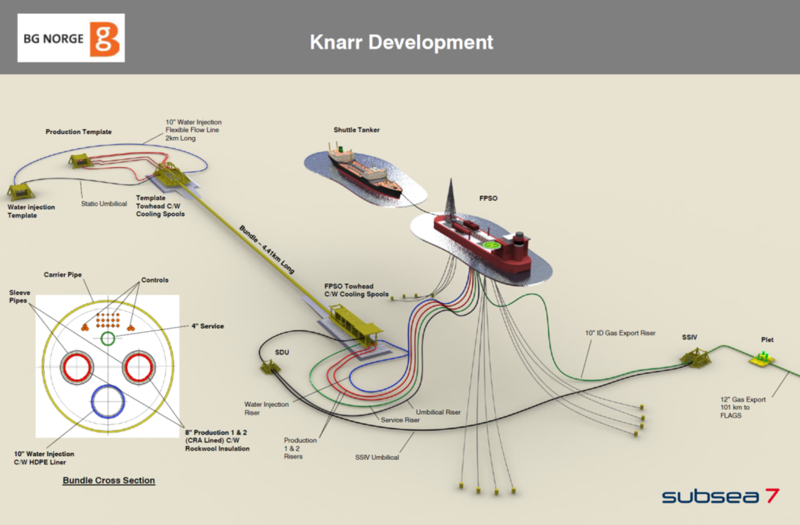 After fabrication and testing the Knarr bundle was pulled into the sea by use of three large anchor handler vessels with total bollard pull above 800 tons before being towed more than 500 km and installed in the Knarr field. The towing operations took approximately 2 days with an average speed of 5 knots and the installation at Knarr took less than 3 days. The main reason for the large towheads is that they both include 100 meters of cooling loops for each of the two production pipelines. The cooling loops reduce the temperature of the produced oil and gas below 90 degrees Celsius before entering into the flexible risers between the bundle and the FPSO. This requires a number of valves and control system components which also contributes to increased weight. In addition the towheads are fitted with buoyancy tanks during installation and the total “dry” weight of the towheads during installation were 550 tons for the template end and 440 tons for the FPSO end. Due to the buoyancy tanks and air filled members the towheads are neutrally buoyant when fully submerged. The template towhead is made fully protected against fishing activities in accordance with NORSOK requirements while the FPSO towhead is located inside the FPSO safety zone which only requires dropped object protection. Integrating the cooling loops in the towheads avoids installation of a separate subsea structure and reduces the number of tie-in spools and subsea connections. The cooling loops are located on top of the production headers and fluid will drain into the headers when production is stopped and this introduces requirements for the verticality of the towheads. The weight of the towheads and the requirement for verticality created challenges for the foundation design as the seabed consist of soft clay. This challenge was solved by installing rock foundations prior to bundle installation. In addition one pockmark on the bundle route was filled in order to flatten the seabed. Rock installation was performed a year before the bundle installation in order to allow for consolidation of the clay and survey was performed after 6 months in order to identify potential settlement. The rock installation was performed with high accuracy and no settlement was observed after 6 months. Both towheads were installed well within the verticality tolerance. The Knarr project is confirmation that installation of pipeline bundles is possible in deeper water and that challenges with foundation for large and heavy towheads on soft seabed can be solved. 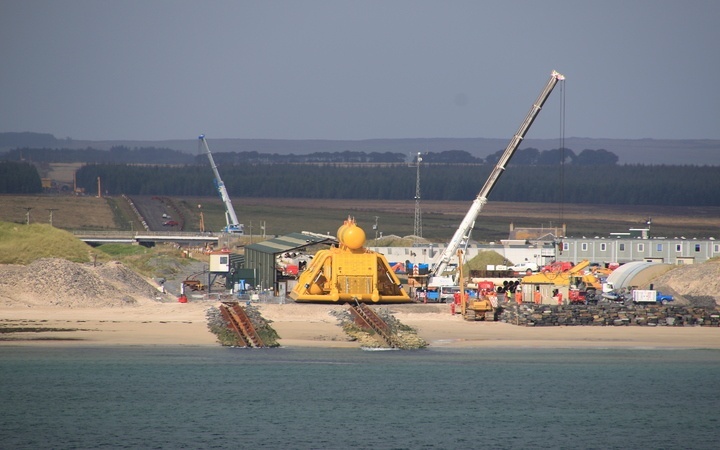 Large towheads allow other subsea components such as the cooling loops to be integrated and installed together with the pipeline system.